Hello and welcome, to what I hope is a somewhat exciting revamp for Zelda Runners, now featuring more news, guides, and insight than ever before! In today’s Glitch Exhibition, we’re talking Majora’s Mask, and why the Song of Soaring is more important for speedrunners than you might think. We’re also recapping on the results of the recent Breath of the Wild any% tournament, as well as a brand new A Link to the Past category to sink your teeth into. Not content with just reading, and want to take part yourself? Head on over to The Final Split segment, where I’m bringing you the latest news on upcoming events, races, and tournaments! 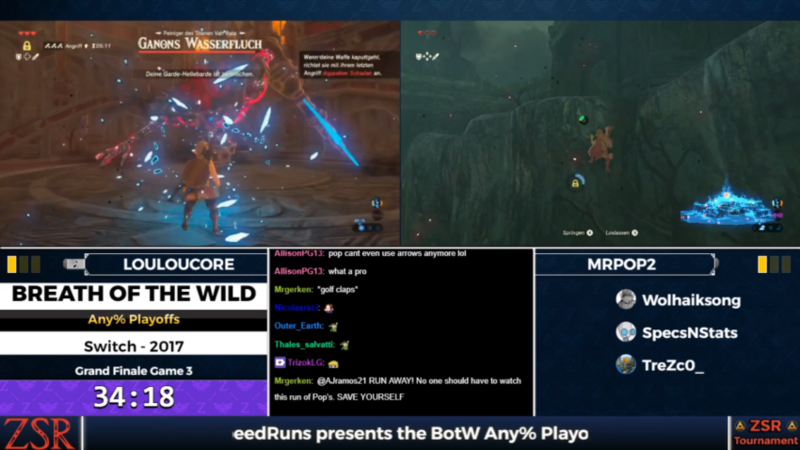 Beginning way back in July, the Breath of the Wild, No amiibo, Any% tournaments finally came to a head this past week, concluding with an exciting best of 3 head to head between runners LouLouCore and MrPop1. Following the discovery and development of Shield Skewing, LouLouCore used an updated any% route, which skips activating the Plateau Tower, whereas MrPop1 followed the older, but safer route of activating the Tower before completing shrines. MrPop took the first race, after LouLouCore had some difficulty with a stasis Launch. Following this, LouLouCore ironed out stasis problems, and the new route’s time save showed, winning them the following two races. The 4th game proved to be perhaps the most exciting of the set, with a Game Over forcing both players to improvise in the Hyrule Castle section of the run. Ultimately MrPop prevailed, taking the finals to a fifth game. This final set was close, however LouLouCore pulled out all the stops to ensure a 3-2 win over MrPop, earning him the win of the tournament! You can watch the entire set on the ZeldaSpeedRuns Twitch Channel here. Taking place merely days after this was the first Speedrunner Showdown, an event which pit two speedrunners at the top of their respective games against each other. Ocarina of Time 100% World Record Holder zfg faced off against his 3D equivalent, benstephens56, in a showcase of each game’s 100% category. One of the most frequently asked questions, in both streams of the original and 3D remake is “What’s the difference between this and the original/remake?” – this showcase hoped to answer most of these questions, by showing the routes side by side. Due to the original game’s record time being around 20 minutes faster than the remake’s, zfg finished first by quite a margin, however both runners enjoyed the experience, and it’s hoped that the feature will become a regular occurrence in the future. New rules were introduced to the Breath of the Wild Community. Timing now starts upon the runner gaining control of Link, eliminating any advantage given by previous save files (such as skews or reduced loading times). A change to the 100% rules also allows runners to take 2 breaks of up to 9 hours during their run, in a move which is hoped will make the 30 hour category more accessible. You can find out more about these rule changes here. A new A Link to the Past Category was introduced! The 100% Item Completion category requires all parts of the regular 100% run, plus all maps, compasses, Boss Keys, all items (including those which are surpassed later in the game) and max capacity bombs and arrows. It’s hoped that this new category can showcase some exciting new routing within the game. You can find out more about this new category on the A Link to the Past Discord. 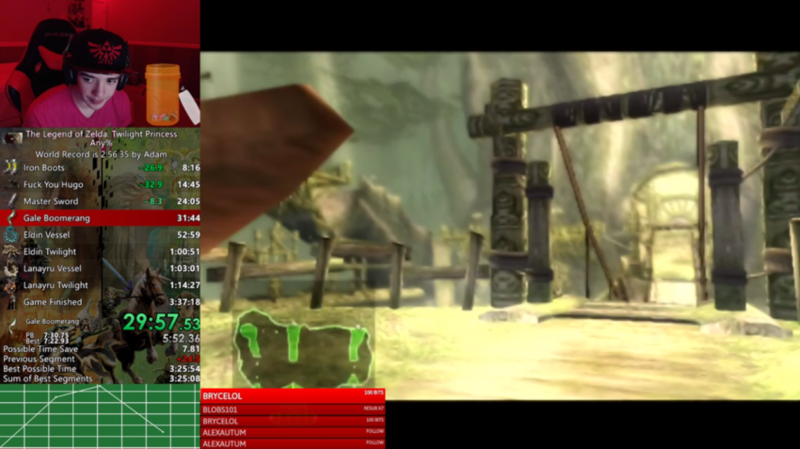 A new Majora’s Mask any% World Record has been set! Long time runner, EnNopp112 broke his previous time of 1:16:12 by 13 seconds, clocking in with the first ever sub 1:16 (1:15:59). EnNopp has long dominated this category, and recent discoveries have allowed him to cut his time down even further. 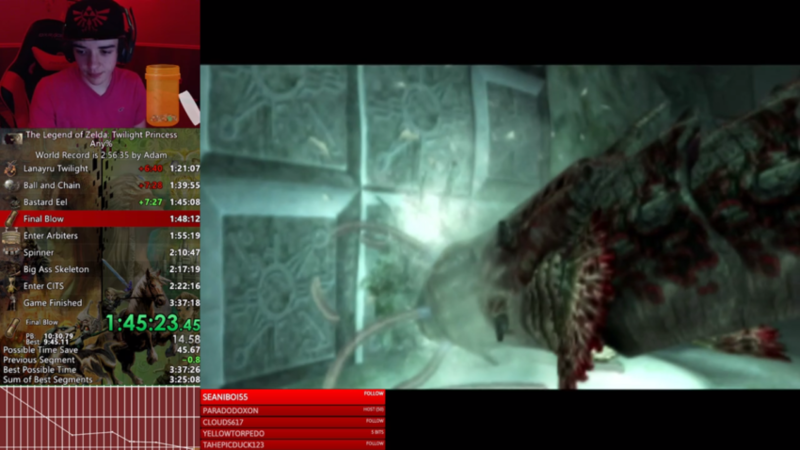 He has since moved on to the 100% category, which he has already claimed the record in, and shaved 8 minutes off the previous record. You can watch the record breaking run here. This week we’re taking a close look at the land of Termina, and how a collection of glitches within the original Majora’s Mask make travelling between the main areas of the land much easier. The first of these is known as the Hidden Owl Statue. When standing in West Clock Town, look through the transition to South Clock Town and you’ll see an Owl Statue. This is obviously meant to give the illusion of the owl statue that sits facing this transition in South Clock Town, but is in fact an entirely different Owl. This Owl (which is really situated in West Clock Town’s map) isn’t normally accessible, as the transition will take Link to South Clock Town before he can reach it. However, using explosives hovering (see the Glitch Exhibition in this article), the player can hover over this transition, and activate this hidden owl statue. This action on its own has no major consequences, the statue can’t be soared to because it has no index on the Song of Soaring map, and attempting to save and reload at it will spawn Link in the game’s default map, the Mayor’s Residence. However, paired with another trick known as Index Warp, this Owl Statue becomes very important. Normally, when the player plays the Song of Soaring without having any active Owl Statues, a text box will appear prompting them to do so before attempting to warp. However, activating the hidden owl statue tricks the game into thinking you have somewhere to warp to, which in turn brings up the song of soaring map, albeit with no locations available. In order to make use of this glitch, the player must first open up their regular map through the pause menu. From here, they can place their pointer on any location that they have “discovered” (anywhere that isn’t covered by clouds). Each location will give a different outcome, and each warp is noted in the table shown. Place your pointer on the location that gives the desired outcome, then exit the map menu. Play the Song of Soaring, and the warp map pointer will default to wherever you selected on the regular map screen. Don’t try to move the pointer from here, doing so will crash the game. Instead, simply select this location, and you’ll be warped to the corresponding statue. 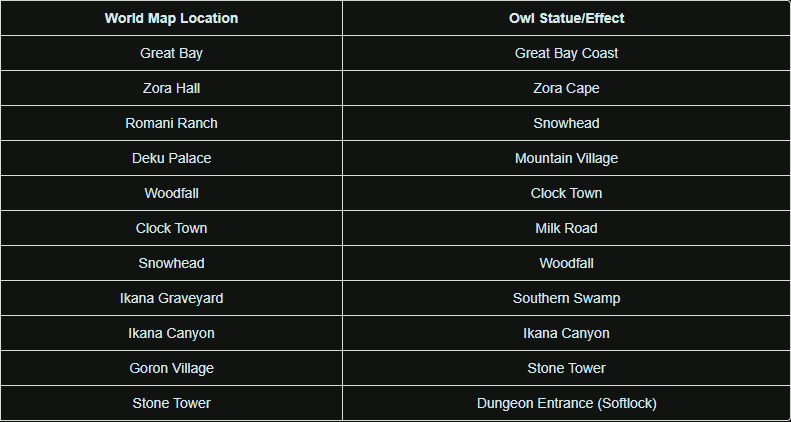 For example, selecting Snowhead on your map menu will warp you to the Woodfall Owl Statue. Likewise, selecting Goron Village on your map menu will warp you to the Stone Tower Temple entrance. means that playing the Song of Soaring without first choosing a location on the Map Menu will warp Link to the Great Bay Coast owl statue (as this is the location that corresponds to the Great Bay statue). Another caveat of the trick is that attempting to warp to the Stone Tower owl, will instead warp you to the beginning of your current dungeon (how the Song of Soaring usually works when played in a dungeon). Attempting to do so outside of a dungeon, however, will softlock the game, leaving you stuck on the soaring screen with no option but to reset your game. The glitch is only possible if the Hidden Owl Statue is the only activated statue. Once the player activates another statue, the glitch cannot be performed. This glitch is possible thanks to the pointer on the Map Menu and on the Song of Soaring Menu sharing the same byte in the game’s memory, allowing one to manipulate and alter the other. Index Warp is used throughout the game’s any% category, to warp between the 4 corners of the land without the need to travel between areas or activate any owl statues. Likewise, it is used often in the first few hours of 100%, however Owl Statues are a requirement for this category, so it eventually becomes useless. 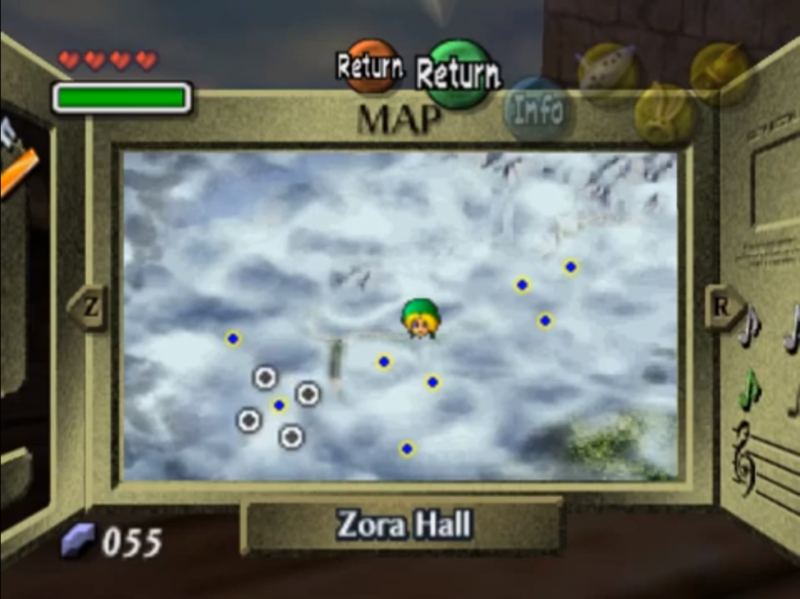 The final glitch we’re looking at today is also incredibly useful when it comes to navigating Termina – Alternate Exit. 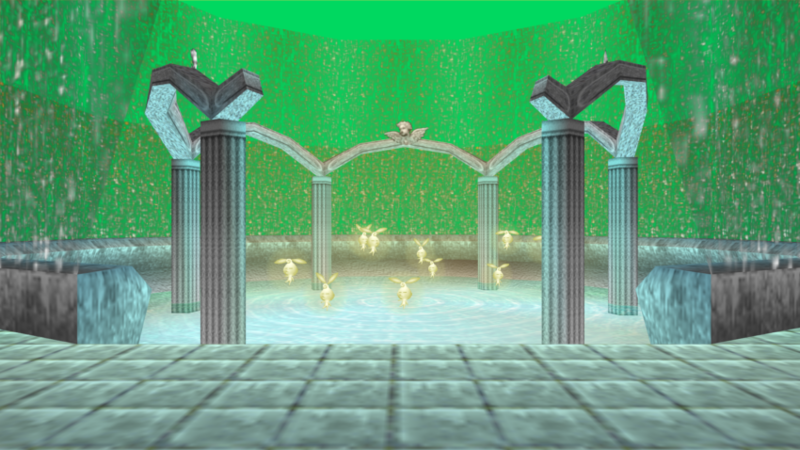 Areas which have similar themes and features (such as Fairy Fountains, Zora Hall Rooms, etc.) are usually all stored within the same map to save memory. While only one room’s graphics are loaded at any one time (the room in which the player is in), the collision and, more importantly, the exits, for all rooms on any map are always loaded. This means that, if a player can somehow escape from the room they’re currently in (usually by hovering), the can make use of these alternative exits, transporting them to another location. There are two main uses of this, the first of which is in Fairy Fountains. All five fountains are located on the same map, in a straight line. 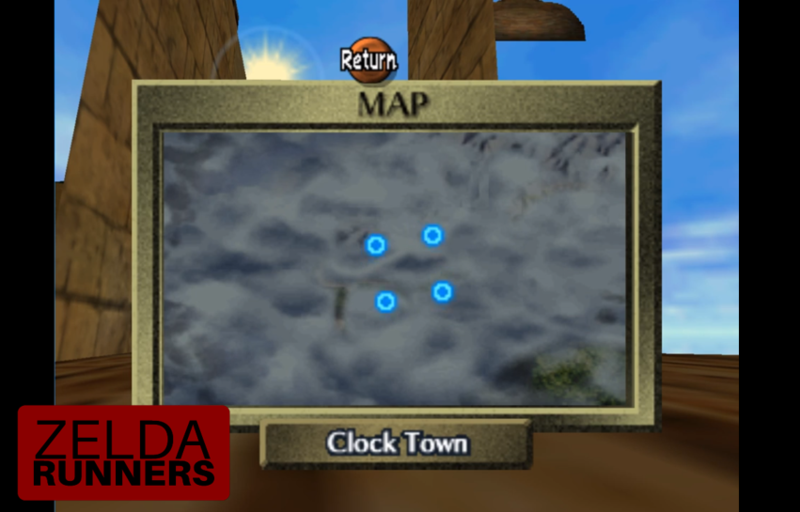 They run from left to right, in the order Clock Town, Woodfall, Snowhead, Great Bay, Ikana. 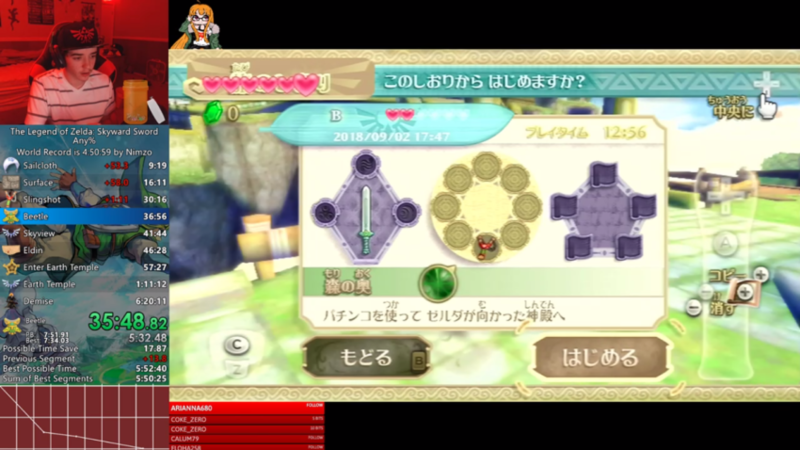 In order to clip out of a fountain, players can use explosives and the Zora Mask, although it is possible to do so with only the Zora mask. This is used within the 100% route to collect multiple Stray Fairy rewards without having to travel between the two areas. The other areas in which this trick is often used is within Grottos. Some grottos have no collision above the stream of light Link uses as an exit. 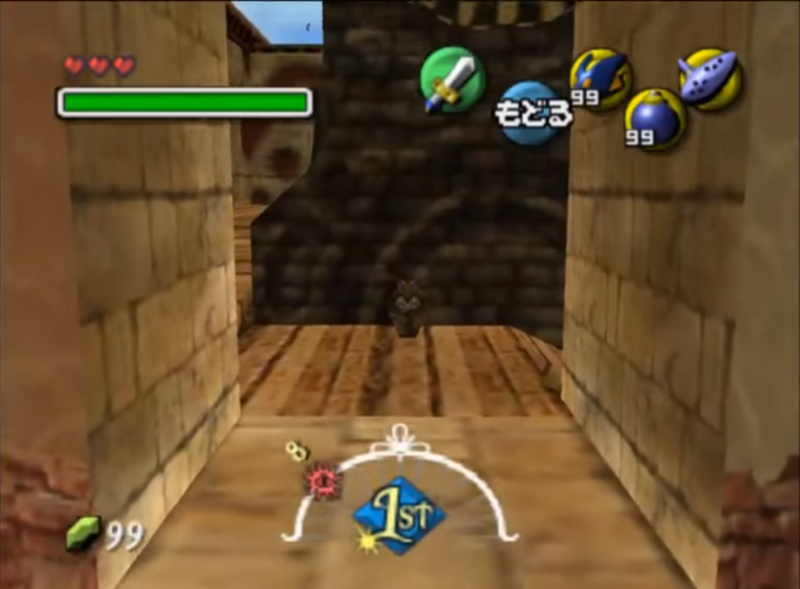 This can be used to escape these rooms, and access another exit (to check if a grotto has collision, fire an arrow or the hookshot at the area above the exit. If it collides with something, there’s collision, if not, there’s a gap). This is particularly useful in the Japanese any% route, which uses a Termina field grotto to warp to within the Deku Palace. It’s also possible to warp from a generic grotto to the Lens of Truth Cave. 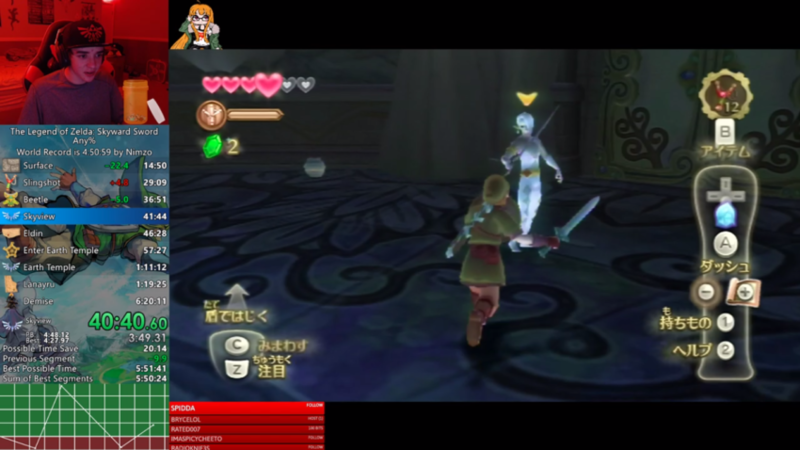 This week I had a chat with Twilight Princess and Skyward Sword runner, baileyp75. Having commentated the recent Skyward Sword Harp% community race, I asked him about his experience within these communities, and what it was like attending a speedrunning marathon, Summer Games Done Quick. EC: Tell us a bit about yourself ! Bailey: I am focusing on Skyward Sword for right now, I ran Twilight Princess in the past although I’ve never been close to the records in either game. I am still newer to the speed running scene as I’ve only been doing speedruns of games for about a year now. I found these amazing communities on twitch and I was always watching in the chat admiring all of the cool tricks and strategies runners do. These streams and people helped me through some rough times I always wanted to do that for others. I started running Twilight Princess and the bigger the following I got the more I hoped I was helping at least one person. I loved explaining all of the tricks to people that were confused it really made me feel like I was contributing to something bigger in my own little way, even if it was a small contribution. EC: Twilight Princess and Skyward Sword are two of the smaller 3D Zelda communities. What’s it like having a smaller group of runners to work with? Do you prefer a quieter community, or would you rather have an community the size of, say, Ocarina of Time‘s? Bailey: Both communities are so supportive the smallest personal bests. Even if you’re 2 hours off of world record, you’re met with tons of support and congratulations. It really helped me get started because I felt like I had friends that would help me through any struggles I was having with Twitch. I know basically everyone in both communities on a personal level. I would say that I prefer the quieter communities because small things like I mentioned before get swallowed up by discussion on routes or tricks. To me it feels like you have to be top 20 on the leaderboard at least for anyone to really care what you say or your opinion on something. I would say starting off in a smaller community for new runners is the way to go because you need a support system for the small accomplishments you make when you feel like you are stuck behind a wall and cant beat your time. The support I got in scenarios like this is what has kept me running up until now I might not have amazing times but having people that do have amazing times tell me “you’re doing good” or “my first few runs were just as bad man, no worries, you got this.” It really helps when you first start off it puts it in to perspective that even the people that are the best at a game had to start somewhere. The small community was also really amazing when I went to Summer Games Done Quick because I knew most of the people in my community on a more personal level I was able to hang out with so many awesome people that I have looked up to and respected for a while. EC: What’s it like attending a speedrunning event such as a Games Done Quick? Obviously there’s more to see and do than what most people see on the stream, and it must be nice to meet the people who have helped you with your runs face to face. Bailey: Summer Games Done Quick was one of the best experiences of my life, I would say. When you go most of the time you spend is out of the showroom. Spending time with people I wouldn’t be able to without the event is what mad the whole trip worth it. There is an arcade room a board game room and all kinds of other things sponsored by the event that are rarely shown on stream. And that’s just the sponsored stuff from the event, there are always countless things going on in the hotel rooms. EC: Would you ever consider expanding your Zelda repertoire to other 3D Zeldas, or perhaps even to the 2D games? Bailey: Before I was ever streaming I would practice all kinds of tricks in games and learn routes. I learned half way through “A Link Between Worlds” Any% the run was really fun for I just never had the resources to buy a 3DS capture card. I really want to go back to it after my Skyward Sword time is sub 5. Also in the past week alone 3 new tricks and setups were found for Twilight Princess 100% And I am really interested in that run as well. Eventually I would like to be like gymnast86 and be good at all kinds of Zelda runs and have respectable times in all of them. EC: Being a relatively new runner, what would you say to potential new runners, who want to start speedrunning, but don’t know where to start? Bailey: New runners looking for a place to start should see what their favorite runner is playing. Even if the game looks really hard to learn with a little bit of practice everything ends up becoming muscle memory. Difficulty should never be a deterrent because even the simple games require the same amount of practice to get good, and if you are struggling with something in a run join the discord or ask a streamer doing runs. Also, if the game has one, I would recommend starting on beginner route, as the routes world record uses probably only saves a minute or two with a huge difficulty spike. If I had to stick to one game and category it would probably be Skyward Sword any%. It’s the first thing I ever watched on Twitch I have a real love for the run and route. The motion controls mix things up from the standard controller play style and, on top of that, unlike other Zeldas you can’t always move at max speed because you are limited by stamina. This adds a whole different layer to manage instead of rolling everywhere. While Skyward Sword doesn’t have a lot of breaks, the route is very optimized. All of the dungeons have super small movement techs that save seconds but add up over time. For instance, every time you roll you save one frame over running the same distance. So if you get 30 rolls in optimal places then you just saved a second and, over a 5 hour run, those frames add up very quickly. baileyp75 can be found on Twitter, and streams on his Twitch Channel. As fantastic as these articles are (you were all thinking it don’t lie), sometimes they’re just not enough. That’s where this section comes in. Listed below are the upcoming speedrunning tournaments, marathons, and competitions you can take part in over the next fortnight! Super Stigma Slam 2018 – 6th ~ 8th October – A marathon dedicated to creating and improving resources, guidelines and training about mental health issues in the gaming community. The event opens with a Zelda II All Keys run, and a Randomizer and 100% run later in the event too! Zelda II All Keys Tournament – Early October – The annual All Keys community tournament is gearing up once again. Think you’ve got what it takes to take on other runners in a race to open all the doors? The tournament starts early October, and you can find out more on the Challonge page here (or in the Zelda II Discord linked). The Wind Waker Randomizer Tournament – 15th October – Tired of the same old Wind Waker? Want to spice it up a bit? Then this is the tournament for you! Test your knowledge of the game to the max with random seeds, and see if you can prevail against your opponents! That’s all from me this week! As always, if anything mentioned in the article has peaked your interest, let me know! Until next time! Euan is the host of Zelda Dungeon’s Speedrunning series, Zelda Runners. He can be found on Twitter and Discord (Euan Crombie#9657), and is by far the most Scottish member of the ZD team.